Maintaining a strong core is something that will help you avoid injury, especially to the hip and low back. The previous post done by my colleague Dr Lundahl discussed the muscles of the core and their function, and if you have not checked that out yet- please do! The purpose of today’s discussion is to highlight a specific core muscle- the transverse abdominis. The transverse abdominis is often overlooked, because of how many layers of muscle lay over top of it. It is not a muscle that makes you appear ripped, or one that creates the “six pack” look. The transverse is a muscle that creates stability, and allows for the efficient movement of your upper and lower limbs. The transverse abdominis is not visible, therefore it is often not trained, muscles like rectus abdominis (6 pack) and the obliques tend to be prioritized. The aforementioned abdominal muscles play a role in stabilizing your core, but their function is secondary to that of the transverse abdominis. The transverse abdominis is your deepest layer of abdominal muscle. All the other abdominal muscles- the rectus abdominis, internal oblique and external oblique-lie on top of it. Because of this, creating stability and strength in your core starts with the transverse- it is the foundation that everything else rests upon. The transverse plays a huge role in human movement. To better understand the mechanics of human movement, imagine the rib cage and pelvis to be a cylinder. 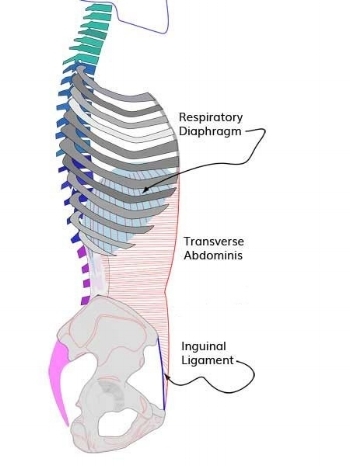 The walls of this cylinder are made up of the ribs, the pelvis, the thoracolumbar fascia and the transverse abdominis. The fibers of the transverse run horizontally, and attach to the rib cage and pelvis. As can be seen in the pictures provided, it creates part of the “walls” of your cylinder- primarily in the front and sides of your body. The legs and arms anchor to this cylinder. Efficient movement of the limbs occurs as movement around a stable cylinder. The transverse abdominis is the muscle that helps to create stability in your cylinder. It does this by pre-activating before any limb movement occurs. This activation creates tension. The tension helps to secure the attachment points of your arms and legs, allowing the joints to maintain optimal alignment when in motion. Without transverse activation, the system becomes inherently unstable- causing inefficient movement patterns that will lead to energy leaks, and will increase the potential for injury. Stay tuned for the next post, where we will be talking about strategies to activate and strengthen your core - including your transverse abdominis!